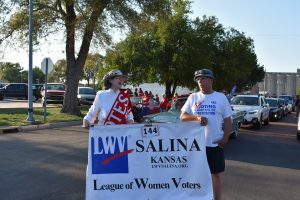 LWV of Salina | The League of Women Voters of Salina is a non-partisan, grassroots, volunteer and political organization with eight local Leagues across the state. LWVK encourages the informed and active participation of citizens in government and aims to influence public policy through education and advocacy. The League of Women Voters is a non-partisan, nonprofit political organization encouraging informed and active participation in government. It influences public policy through education and advocacy. 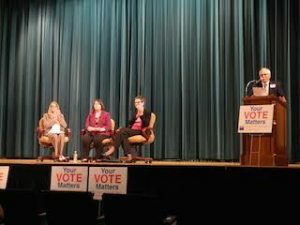 We sponsor candidate debates and public issue forums. 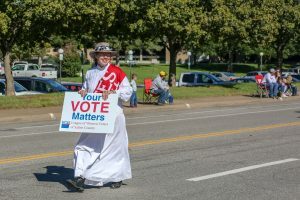 The League of Women Voters of the United States (LWVUS) grew out of the long struggle to achieve the vote for women. The 19th Amendment to the U.S. Constitution, which granted women in the United States the right to vote, was ratified on August 18, 1920, ending almost a century of protest nationally.In response to the 19th Amendment, members of the National American Women’s Suffrage Association formed a new organization: a national League of Women Voters. Jane Brooks, Wichita, president of the Kansas Equal Suffrage Association, was the first permanent national LWV chair. She returned from the national suffrage convention to start the first local League in the nation in Wichita. See plans for our year long celebration. Keep up to date on our Kansas Legislature with LWVK Legislative Liason, Paul Johnson’s, Policy Watch. This bill addresses voter access, election integrity, election security, political spending, and ethics for the three branches of government. Read the details of this important legislation then call your Senators. The League calls on elected officials to do what’s right for the personal and economic health of Kansas. KanCare is the Kansas version of Medicaid. 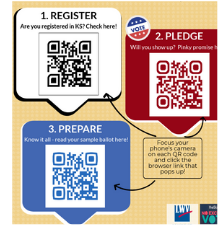 Scan these QR codes to register, pledge or learn about your candidates and election info. To find out about your candidates see our page “About Your Candidates” or Vote411. Documentary proof of citizenship is NOT required when registering to vote, per the Federal District Court ruling on June 18, 2018, by Judge Julie Robinson declaring the Kansas Documentary Proof of Citizenship law violated the National Voter Registration Act and the U.S. Constitution.